Elmore County was created by the Alabama legislature on 1866 Feb. 15, from parts of Autauga, Coosa, Montgomery, and Tallapoosa Counties. Elmore county is located in what once was the heart of Upper Creek territory. The present-day towns of Wetumpka and Tallassee, located on the banks of the Coosa and Tallapoosa Rivers, retain the names of the former Creek towns on those sites. Tuckabatchee, one of the principal towns of the Creek Nation, was also located in Elmore County, near the town of Tallassee. After the arrival of the French in Mobile in 1702, Jean-Baptiste Le Moyne, Sieur de Bienville, sent an expedition up the Alabama River to what is now southern Elmore County to establish Fort Toulouse, completed in 1717. With a rich heritage dating back to the 1700’s. 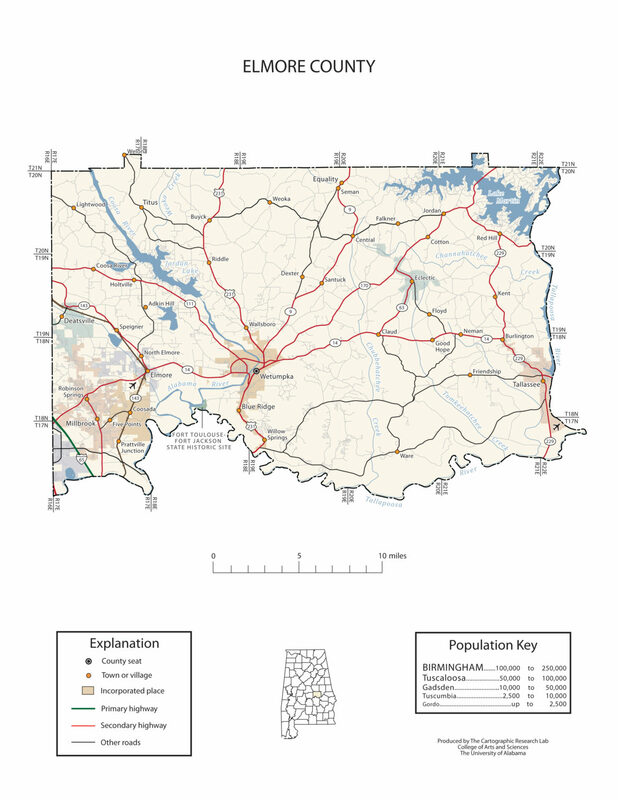 A rapidly growing Interstate 65 city, Millbrook, Alabama is located 10 miles north of Montgomery, Alabama’s state capital. Immediately accessed via Interstate 65 Exits 176, 179 and 181, Millbrook’s proximity and inclusion in the Montgomery MSA (population 374,536), help shape the city and provide for exceptional career, educational, cultural and recreational opportunities. Regularly ranked among Alabama’s fastest growing cities, Millbrook’s present day estimated population is 14,734. Wetumpka identifies as “The City of Natural Beauty”. Among the notable landmarks are the Wetumpka crater and the Jasmine Hill Gardens, with a full-sized replica of the Temple of Hera of Olympia, Greece. Historic downtown Wetumpka developed on both sides of the Coosa River. It was located near Fort Toulouse, built by French colonists in 1717, when they had claimed this territory for the king. Within the calm settings of the beautiful River Region, there is a place where memories are made. A place where freedom and adventure still capture the hearts of people. Discover a place in America’s south you may just want to call home. That place is right here, the Town of Elmore, Alabama!